I spent most of my weekend in the kitchen, trying out new recipes and really enjoyed making new things and pushing myself. I've done loads of baking and I will be sharing some recipes later in the week but today I'm sharing a recipe for a jam/chutney with more than a little kick. This is something I improvised and came out as more of a chutney than a jam which is what I intended it to be. It makes a good accompaniment to meat or the veggie burger I made on Saturday night. You can double this to make a large jar or add more peppers if you prefer it sweet. 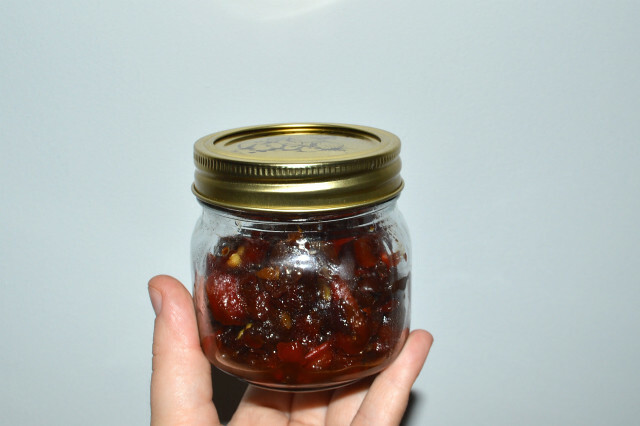 If you want your chutney to last for a while, make sure you have a small sterilized jar ready to go. I just got a jar and filled it with boiling water, emptied it and put the finished jam in. Place your chillies and peppers under a hot grill, turning them now and then until blackened. Put the peppers and chillies into a bowl and cover with clingfilm. By the time they're cool enough to handle, you'll be able to peel the skin off easily. Remove the skin and seeds and chop finely by hand or in a processor. Heat a saucepan and pour in a splash of olive oil. Add the onions and season. Cook very slowly for about 20 minutes. Add the chopped peppers and chillies, the sugar and the vinegar to the onions and keep cooking. When the liquid reduces and you're left with a lovely thick sticky chutney, season well to taste. Either spoon into the sterilized jars and put them in a cool dark place, or keep in the fridge and use right away. In sterilized jars, the chutney should keep for a couple of months. 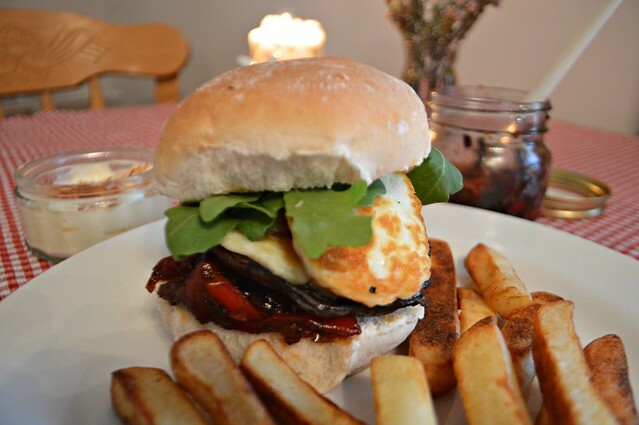 I used my chutney to add flavour to my portobello mushroom & halloumi burger. I simply cooked the cheese and mushrooms in a griddle pan for around 20 minutes, turning half way through and served them in a soft bun with some rocket. I added some lemon juice and crushed garlic to my mayonnaise with a dash of paprika on the top to dip my chips in. I loved this burger and the chutney had just the right amount of heat for me but I'm not sure Martyn (a committed carnivore) was entirely sold on a meat free burger. Are you a keen preserver? What should this jam/preserve novice try next? This sounds incredible! I am a big fan of portobello mushrooms, yummy! I'm not a big preserver but my fiance is - I will ask him for some suggestions! 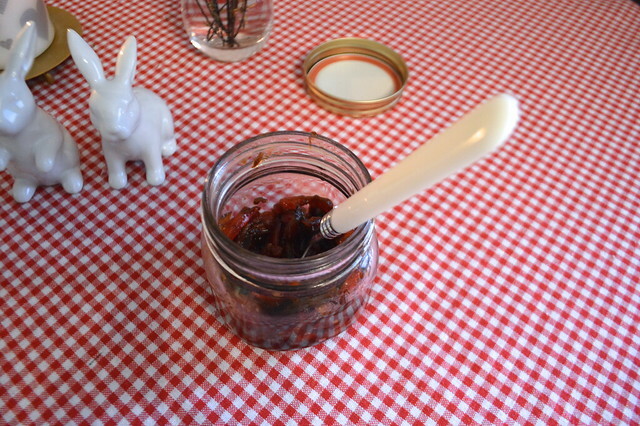 I adore chilli but have not quite got round to making chilli jam, plus the burger looks lush. Wow Gem you're a whizz in the kitchen! Love the sound of this meal. This sounds SO good! Food round yours yeah?